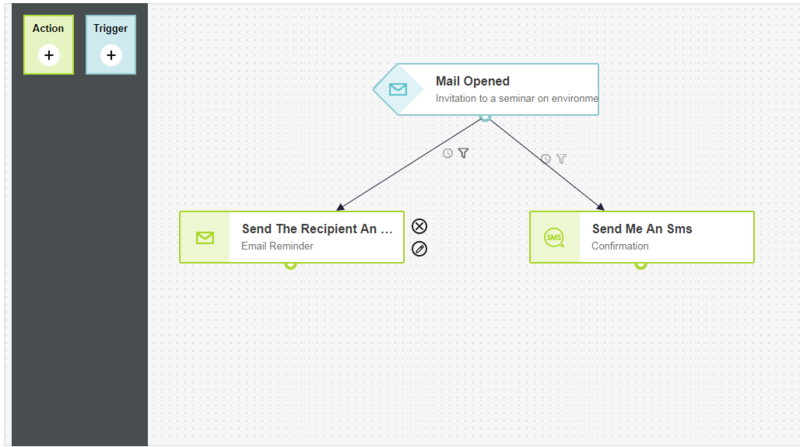 Marketing automation allows you to set actions who will automatically perform as a reaction to differences scenarios. The automation system turned on due to some triggers that can be customer action, such as: Open Email, Click on Email or registering to specific mailing list. For example: when contact click on a link in the campaign, additional campaign will sent to him, and while clicking on another link, SMS will be sent to him. Basic automation is an automation that contain one trigger and one action. Each automation designed from trigger and action. Trigger – Is the factor for the scenario. Action – The action that will perform after trigger turned on. Adding trigger (1) and action (2) to the automation, performed by dragging the elements to the automation editor. In order to connecting them, click on the circular part under the trigger (3) and drag an arrow to the action direction. You can delete (1), define and edit all the properties of each trigger and action by clicking on the pencil icon (2) that will open the properties editor interface. In additional, you can filter contacts segmentations which the action will apply them, and schedule the action. We’ll click on Trigger editing and we’ll define the trigger type, then select one of the triggers list the system suggest us (opening, clicking, update form in landing page etc. ), and according to the trigger type we select from the list the additional settings (Campaigns list, Text messaging, Landing pages). In the example, we selected trigger “contact opened mail” therefor we have to select the campaign name which the automation will activate. You can edit any automation and set the segmentation of the contacts which the automation will be activate. You can create several segmentations. In order creating and editing segmentation, click on the funnel icon. 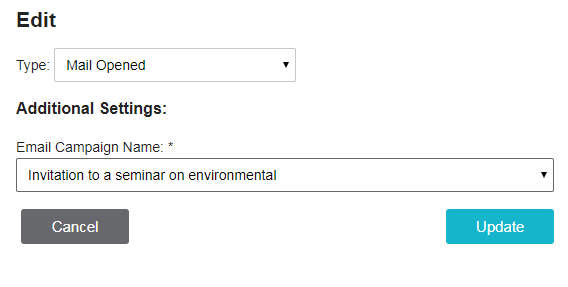 We can select if we want to set the filter on all the conditions or just one of them. We can add conditions as much as we want by clicking on “Adding”. (In our example we select automation action that will occur only if the contact who performed the action is a Male). Clicking on the clock icon open the timing interface. We can select the time when the automation will be executed. You can select minutes/hours/days/weeks and then add a number in the corresponding field to the selecting. Complexing automation is an automation that designed from 2 or more activities. We’ll add to the basic automation another action by dragging an “Action” into the automation editor interface. We’ll select from the list the automation purpose by clicking the pencil icon (Edit) and we’ll select from the drop down list the action type. In our example “Send SMS to the contact”, then in additional settings, we’ll select the SMS campaign name from the campaigns list. After finishing edit the automation we’ll click on “Next” in the lower interface right side. In the next page (Automation activate page) we can change the automation name and add description for internal purposes only. To activate the automation, click on “Publish” on the page right side then you’ll get immediate message that the automation published. In case that we want to edit or stop the automation after the activation, we can click on “pause” button, and the automation status will change from “Active” to “Draft”. Now you can delete the automation, or edit it and re-active it again.